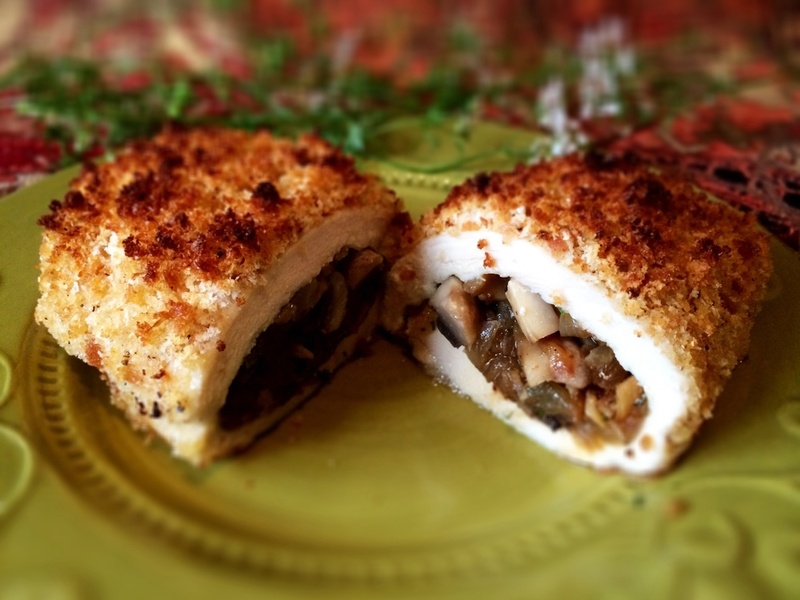 Chicken Supreme Kiev-Style — Good Food Makes Me Happy! The man can do no wrong! Jacques Pépin's Chicken Supreme Kiev-Style ("Good Life Cooking") is a must have recipe to include in your list of favorites. Boneless, skinless chicken breasts are butterflied and lightly pounded between two sheets of plastic wrap to achieve a uniform thickness; a mixture of sautéed onion, garlic, mushroom, salt, pepper, and fresh cilantro is set in the middle of the chicken breast and then folded over to enclose the stuffing, dipped in milk (I used soy milk) and rolled in fresh bread crumbs seasoned with salt, pepper, and more fresh cilantro with a touch of olive oil to prevent the crust from burning. Bake in a 400-degree oven for 20 minutes. The result is an herbal-infused, moist, crunchy mouthful ... absolutely delicious! Definitely use fresh herbs as dried herbs would not do this dish justice. If you don't care for cilantro, substitute your favorite herb. Tarragon, dill, thyme, or another fresh herb would work well here. Parsley might be okay if that's all you have, but it wouldn't pack enough of a punch, in my opinion. Serve with a simple green salad and a glass of Penner-Ash Viognier, and that's it! Slice horizontally almost all the way through the chicken breast, open like a book, put between two sheets of plastic wrap and pound lightly to achieve an even thickness. For the filling, heat olive oil over medium high heat, add onion and saute for 2 minutes. Stir in mushrooms, garlic, salt, and pepper and cook, covered, for 3 minutes. Add the cilantro, stir and transfer mixture to a plate to cool. When the filling is cooled, mound one portion in the middle of each chicken breast. Fold meat over the filling to enclose it completely. For the coating, mix the bread crumbs, cilantro, salt and pepper in a bowl, add the 2 T. of olive oil, stir and set aside. Dip the chicken breasts in the milk, then roll in the bread crumb mixture, arrange on a roasting pan and bake for 20-25 minutes in a 400-degree oven. – Jacques Pépin, "Good Life Cooking"